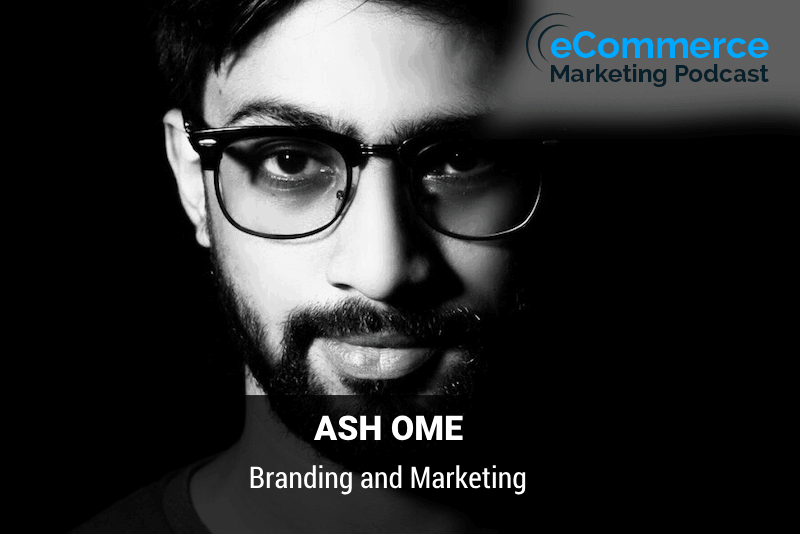 Ash is an enlightened entrepreneur and founder of the creative ecommerce agency Motif which helps ecommerce businesses increase conversions using beautiful solutions. Welcome to the podcast Ash. How's it going? Hi, Alan. All right. Is going good. Okay, so I'm doing great. I'm awesome. Yeah, thanks a lot. I know we've been trying to connect for a little while now. We're glad to finally get you onto the podcast and like guys. Yeah in today's episode. You know, we're going to be talking about branding and marketing which is you know, Your expertise but you know before we get into that, why don't you tell our audience a little bit about your background and how you got started and how you got into what you're doing today? Yeah for sure. Actually, I am a ux designer and founder and developer eyes to create conversion wave and design for our clients. But so all of a sudden I feel I felt that. Our clients need something else like they need a proper strategy to scale their business. Then I have started this agency to help our clients and our potentials. So this way I enter into this fields and I am working in this field for last four years. Okay? Okay, that's that's awesome. And so what made you decide to start your own agency? Actually, I was getting a lot of clients. Okay. I was a freelancer actually. Okay then. Turned it to agency when I opened this agency. I really didn't know how how an agency website look like then eventually I learned about marketing design psychology and other things but I'm always that conversion guy calls iOS finding the solution for clients. Okay? Okay. Yeah, that's that's awesome. Yeah, it's you know, when you're in the design space you do still have to get have a high and a little knowledge of marketing for sure. Especially these days because you know, the design is not just the website alone. Now, we've got so many social media platforms that require, you know, graphical ads, you know, you've got the Facebook's you've got the Twitter you got the Instagram and so you you have that kind of have an understanding of design elements and what's going to be attractive and what's going to really Drive in those conversions. That's that's really. Is the whole that is a I like to say design without purpose that is just like a decoration, right? So right we cleared purposeful design the drive conversion crazy, right? This is my job. Actually, that's awesome. Yeah, I like that that that slogan and design without a purpose is just decoration. I love that. Yeah, that's that's an awesome catchphrase, you know, so a lot of of course your expertise is, you know, branding and marketing so I hadn't really touched me. About on branding in any of the podcast episode. So what why don't you just Define it for us when you know really what is branding and is it important for a young e-commerce business to do? Yeah for sure. Let me explain how his branding. Branding is the ID of your product service or company. Okay. So many people consider branding as the design and look of a company but that is not true in a nutshell branding is who you are and marketing is how you build honest. Okay. Branding is your Ester dizzy while marketing encompasses your Tactical goals. So this is very important for any Commerce businesses or you know, any internet based business or any offline offline business, but. Is the key to success? Okay. So even right out of the gate when a business first launches, they need to think about branding defining who they are. And yeah in any channels that they're being seen on ghost that that is their guideline for the marketing campaign, they will craft. Okay. So if they have not the proper branding strategy, they will eventually fail right. This is my opinion. Actually gotcha that totally makes sense because I you know, I've seen a lot of cases if if a clear branding structure is not defined as especially early on you a business when they're going out there on these various channels. You could see mixed messaging as far as. You know what it is that they are displaying how they're displaying themselves and you know, they could be displaying themselves to try to attract a particular demographic in one platform. But then another platform it could be a little different. So that really makes sense. If you don't Define a branding strategy early on and who you are as a as a company then yeah, you may not have a consistent message of throughout and that can definitely hurt hurt the business for sure. Is our branding is the key before before you dive into any marketing campaign. You should Define your branding strategy on in place, right so that you can follow that up later on. Right? Right, and I'm glad you said that because I know I've talked to a lot of businesses, you know every day that our e-commerce businesses that are young that are growing and are looking for ways to get out there. And I think I think it's really kind of a misunderstanding a lot of times businesses when they hear branding they think. I don't really need to do any branding. I just need to mark it. I need to promote I need to get myself out there and you know, they're just so yeah, it's done driving those sales when you hear branding I think businesses. Typically they think that's only important for the big guys, you know, the big companies that are have big corporate Brands, but that's that's really a misnomer. It's not necessarily the case. We're definitely not the case at all. Every company needs to be concerned about their brand no matter how large or small yeah, I. So notice that most of the newcomers in e-commerce space, they really don't consider branding as important as marketing bill. Just want to dive into the marketing section. Right? Like I want to sell this thing right now, but they have not a proper message learning style or something like that. So this is why most of the e-commerce businesses are failing right now, right? This is true. This is true and it's something you really have to be concerned about especially these days if your spell if you're selling a. Retail or consumer based product because you have the elephant in the room. So to speak the Amazon that yeah is devouring, you know everything in its path. So, yeah, if you don't have something clear clearly defined across these promotional platforms and you're going to be kind of lost to the Wayside now it now as far as marketing is concerned we've established really what branding is and that every business needs to be concerned about that from day one. What do you think is the most important marketing strategy for a young e-commerce business to focus on okay before starting any marketing campaign, you have to clearly position your brand with a proper branding strategy that hot I said, I would say storytelling is the most important marketing strategy for any e-commerce business right. Now. You have to craft it creative story around your product or brand and relate that to the audience we so you will feel them. They are a part of your company right and and it will really help you, you know causing it will give you more loyal customers. We love you. We love to buy from you. Right that is that is for sure and that's interesting that you said that because I keep hearing so much about storytelling these days. I I did a webinar a couple of months ago in September with a gentleman that use it use storytelling to really catapulted. Their business he's actually a Hollywood screenwriter and him and his wife had started a e-commerce business selling girls dresses and he took his knowledge of Storytelling and screenwriting to create a viral story in a viral video that really catapulted their business and he spoke a lot about the importance of Storytelling and it's so it's really critical that I also I was actually just watching a. A little a show that they have on entrepreneur Network. It's entrepreneur.com. They have a show where it's an elevator pitch show where they get businesses to do a one-minute pitch and in front of some investors and they decide if they want to invest or not. But what they said is even in that little one minute pitch. Yo, a story is still critical if you can squeeze in some initial story Into the pitch, it's critical. So that's how you really know. It's really important. Yeah, because people really don't buy products. They buy the emotional feeling the buy something from you the that they can relate to so if you if you constantly pushing your audience to buy buy stuff from you that you no longer work after few days, I think right. Exactly because you know every these days there's so many options and if you're just approaching people as just a blind company, you're not putting any type of yeah, you know backstory behind it. There's no connection there with the end consumer. So they're you know, they're going to just move on to the next one. So that's that's that's very true. I would like to give you an example with Nike as you can see Nikes doing this from the very beginning, right they have almost the geocells copy and they are selling a Feeling by providing and showing values to a slurps. Mmm. And that is that when they are getting cells from their target audience. Right who are who are anyhow sports-loving or at layers? They are buying products from Nike. Anything like is throwing as your sports lover. I am also I want to buy buy that Nike new Nike sneakers, right? So this is this is this is these Nikes really doing great. So I think Ecommerce businesses can apply that to their business as well. Yeah for sure and you can see that across all of their cat campaigns. I was thinking of it that several campaigns they have with Serena Williams in if you think of any of those videos or commercials it's a little mini story. You know the folks. I mean you see her going through her her training you see you're competing and you kind of get to see who she is and it's that's really the focus is just the connection there. So yeah. Yeah. So right with that now, you know with the we talked a little bit about marketing, of course in The Branding do you recommend. That e-commerce businesses create a formal marketing and branding plan and if so, how exactly should that. Look okay from my point of view. The answer is yes, because without a formal marketing and branding plan in place will be distracted and feel lost but I won't recommend you to make a five to ten pages of plan rather than that, right the core values and how to do in a period of time on a single. Is it what you meant find some some single-piston plate on the web, you know, right so just find on and fill that up with your core values and other things like how to do next what you want to do in the next 90 days or. for in next job 100 days like that, right but not not a proper formal thing, you know. Yeah, you have to just write down everything but you have need a document first exactly that that makes sense. That really simplifies it because I think when you see in when businesses here, you know the words marketing plan or branding plan. I think it's can scare them a little bit about oh boy, you know what I got? Oh my God, you scared me. Actually, I really don't write marketing plan for my agency as well and for myself business as well. I really like to put hot iron to do and hot is our core values. Right and I put down on a paper and that that really helped, right? When we follow up later that will help right and I think another thing that you can do that's that's simple there's that businesses can do is you know, you can just put down a few goals. Like you said come up with like a 90-day plan like what are you trying to accomplish in those 90 days whether it's obtaining a certain amount of sales from pay-per-click marketing whether it's getting a certain amount of sales from your social media campaigns, whatever it is, you know, put down those goals and then just review. Yeah at the end of the pier. Whether it's 90 days 60 days or you know, annually or semi-annually, however, you do it so that that really makes sense doesn't have to be so formal highest really super formalized idea as long as you have something down and have some goals down like before that you have need the clarity hot you want to do what you will do in the next four or five years or where you want to be. So what is your mission and fish from that Israeli very important before putting down anything you need that thing? Yeah Claire. Yes, for sure that that really defines your overall strategy before you really get out there and and and get things exposed to potential customers for sure. So that's that's really super important. Now, I'm a big advocate of learning from other businesses and other successful e-commerce businesses specifically because these days everything is really available online you can yeah, you can see how much companies are spending the. Pay-per-click marketing is so many tools that really can pull the veil. So to speak from what a lot of companies are doing we're back again. You can see everything how much you companies are spending on their on their diverse or anywhere else, right? Also, Facebook is showing how much at how much money we're spending on Facebook ads. So right now with too many tools you can find out everything but that also will do yes. Um, sometimes you are. You're getting a lot of information and you really don't know how to do next that is there is there is a fine line you were right about that but there's such thing as too much information. It can be information overload. So yeah, you really have to yeah, like you do have to draw the line, you know, you want to try to drill down to you know, finding those companies that are similar to what you're doing and focus on you know, what are their strategies like and what do they look like online now as far as from your. Variants what are some successful specifically successful e-commerce businesses that companies can use as a model for Success that you've seen I'd like to tell you about the beard burn turned that is all of the best Bad Company who sells bad product instead of relying on traditional content marketing, but they did they really didn't rely on blogging or providing it. What was it? I'm sorry. What was the name of that company? I didn't break it. Bill Bryant the Barrack that yes beardbrand. Yeah. Okay. Gotcha. If you can can you spell that out for me? I didn't quite follow, you know for sure be B for ball C for elephant a for apple or for race default digital before ball or for raise a for apple. And for what? Can I say? Okay. Okay Nokia default develop. Okay, and what it what it what exactly do they provide? Okay, they sell their product like beard oil and other stuffs like yeah beard beard beard. Yeah, I could have I follow you now big man looping. Yeah, that's that's very popular these days because a lot of men wear beards now and the maintenance of a beard is really, you know, it's a lot to it. And so it's the whole beard industry has experienced for sure. Actually. I'm a big fan of bird. Less they are more varied. So that's what I believe in. Gotcha. This is really very, you know, interesting to me. Okay, I will follow them. Okay, what's successful things have they done as far as something that actually we can be there would be a good take away the suit of relying on traditional content marketing like blogging or other steps, you know, so they did the that thing in a different way they focused on storytelling again. They focused on a storytelling. From close emotional and physical psychological connection with their audience the brand created an unique story telling who is encouraged their customers to identify identify them as urban birds man and come together as a community. So hot there. Created that help Their audience to make a community around them. I think Young e-commerce business can take this inspiration from them and come up with a Content marketing strategy for themselves. Like if you are selling a cynic outs, okay, so you can create a Facebook group about sneakers slobbered. So I though cynical slobber can hang on and share their enthusiasm, you know, right and this way this way this way. Will be a community where you can promote your product later action, and that will be all on autopilot. Right? So I think from bed banned any e-commerce business can take that inspiration for Content marketing so that they can come up with a different content marketing strategy that will all for them. Right that is that is so true. And one of the things that's available. I think this is a recent update. I was interviewing another guest a couple months back as far as social media marketing is concerned these days what you can do it with Facebook. It's like you said like we said earlier everything is transparent. But what you can do to see like a history of all a company's ads is if you go to their particular Facebook page, there is an ads and info link or tab where if you click on that, let's say you went to beardbrand. Page and then click on ads and info. It's going to show you a listing of all of their ads the history of all of them. And so you can also take a look at those and grab some ideas of how they're doing their their Facebook ads the particular messaging that they're using the graphics the videos and so it's really all out there and that really makes it convenient to pull up, you know, some of these other businesses that yeah, that's 'full. Yeah. Okay, and as far as. Branding and marketing is concerned. What do you think is the I would say the most important takeaway that you'd like to impart on our listeners and on as far as what we've discussed today over the most important takeaway is when you are starting your e-commerce company, you should first make a great branding strategy and crap every every marketing campaign around the core values of your brain. The storytelling and your unique value proposition at the way it will stand out in the crowded space right now that Israel crowded so you have to come up with something that will impact on your audience. Right? So if you implement them in right way you want me to look back right right for sure that that's a great piece of advice and you know, it's been echoed by so many of the marketing experts these days. It's something that every business needs to be concerned about. Is that branding and straight away from from day one implementing that and then actually some of the yeah, actually some of the branding strategies are really goes hands on Hands-On marketing studies like this storytelling unique value proposition. All of these things will apply to your marketing campaign later on right without all of this. You can't really create a great marketing campaign, right? And I'm sure that would make a business is job a lot easier because they've got that established already. So when they're doing those marketing campaigns, they already know. Okay. This is what we've established. There's our brand. This is our messaging this is where the story we're going to tell and they're going to keep that consistent throughout so that now you doing also help them to recreate new employees cause they lie about the. Right. Oh hot on how they're working on. So these are this will help them in the future as well. Sure. Sure. Yes other employees won't really be guessing as far as you know, the type of messaging that they're going to put out there and even when they're just yeah telling people in, you know, everyday conversations about the business, they'll it's going to be a core a key consistent message across what everyone tells others so yeah. It's for sure. Well, yeah, that's that's awesome. Well, I really. She ate the info Ash that you've provided us is some excellent takeaways that I think every business that's listening should be able to take advantage of for sure and been doing lately is Switching gears a little bit. And when I ask one final question just to get to know you a little bit better. What's one thing that our audience would be surprised to know about you. I think I have already mentioned that from the beginning that I also designer like other ux designer, but I. To learn about marketing and branding by helping our clients right? I'm still learning by doing doing all of that the thing by helping people know, so right now I am working with the Shopify app that app name is check out if I it will help Shopify March and to recover lost revenue and it will also help them to how can I say? This is all also help them to make make their customer to buy from them again. Okay, okay. Yeah, that's awesome. Will definitely be sure to check out that app. Check out a fi ya love the India. So it will definitely check that out. Thank you. Yeah, that's awesome. Yeah, you're so right I talk to so many people that they start off in one particular feel like you said you were designer and then you learn so much dealing with these customers you had the expertise to really well actually nowadays. Sorry for interrupting you actually nowadays everything like design marketing branding everything is connected so you can't. Only designs you have to know about that marketing and branding a stuff. Otherwise, you will make that decoration thing right now that will not as much really deliver any value to your clients. That is why this goes hands on hands. Right? Exactly. Then that goes back to that slogan that I love that you said, which is design without purpose is just decoration for sure. Yeah. Okay. Great. Ash will then was definitely the pleasure having you on now if our listeners want to get in touch with you, how do they do it? Even I guess. Is most convenient way to contact with me or they can use the contact form on the website. Okay. I am always there. Okay, that's almost tells people they will try to sell them our service. No one will do that. So we are here to help you if you have any questions on on branding and marketing we are here I am I'm also here to help you out. Okay, that's awesome. And then the that website address is digital developed dotnet, which is ashes website. You everyone can go there. Check out what? What they've got going on looks like there's a live chat on there so you can chat with anybody on there and to get any other questions answered. Okay, great. Well, thanks again Ask for joining us today on the e-commerce marketing pies for having me here. Not not a problem. It's been my pleasure. You take care of a great day your tool. Thank you for listening to the e-commerce marketing podcast. You need to get more feedback and reviews from your customers and improve your customer. Retention. We have made it easy to do all of this with our Advanced customer feedback software just visit get OS i.com forward slash feedback and sign up for a free trial today. That's get OS i.com forward slash feedback.